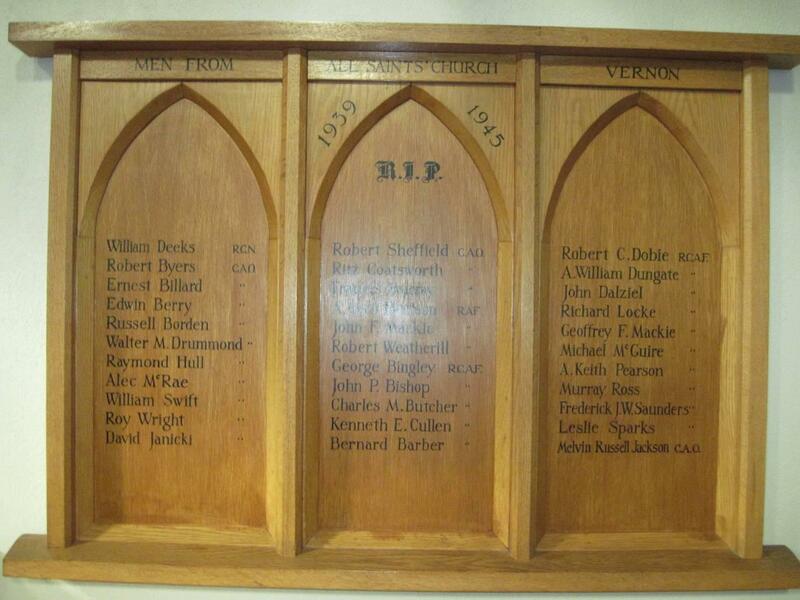 The Cenotaph in the All Saints Anglican Church is located at 3205 27th Street in the City of Vernon. 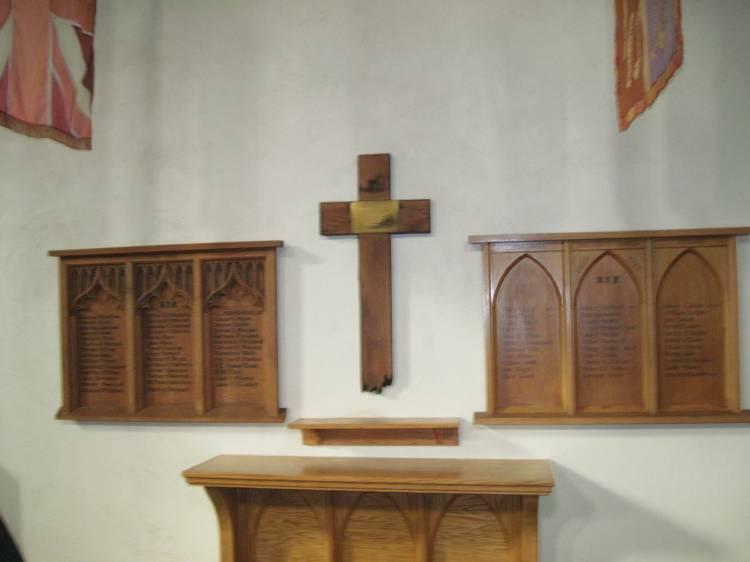 There are two plaques, one dedicated to those parishioners who served in World War I and the other to those who served in World War II. Between the two plaques is a memorial cross dedicated to the 2nd C.M.R. William Deeks,    R.C.N. Robert Sheffield, C.A.O. Robert C. Dobie,     R.C.A.F. Robert Byers,     C.A.O. Ritz Coatsworth,    "     A. William Dungate,      "
Ernest Billard,     "     Francis Murray,     "     John Dalziel,            "
Edwin Berry,        "     A Cecil Denison,   RAF    Richard Locke,           "
Russell Borden,     "     John F. Mackie,     "     Geoffrey F. Mackie,      "
Walter M. Drummond, "     Robert Weatherill,  "     Michael McGuire,         "
Raymond Hull,       "     George Bingley,  R.C.A.F. 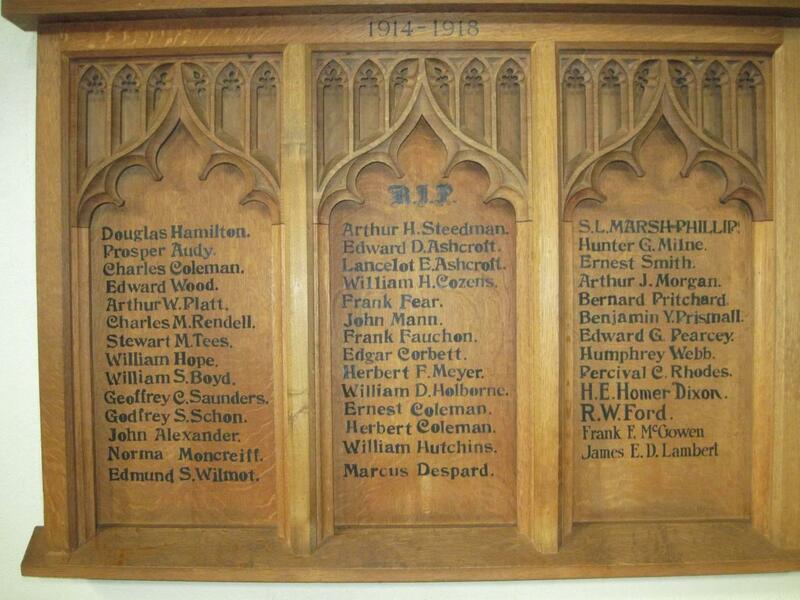 A. Keith Pearson,        "
Alex McRae,         "     John P. Bishop,     "     Murray Ross,             "
William Swift,      "     Charles M. Butcher, "     Frederick J.W. Saunders, "
Roy Wright,         "     Kenneth E. Cullen,  "     Leslie Sparks,           "
David Janicki,      "     Bernard Barber,     "